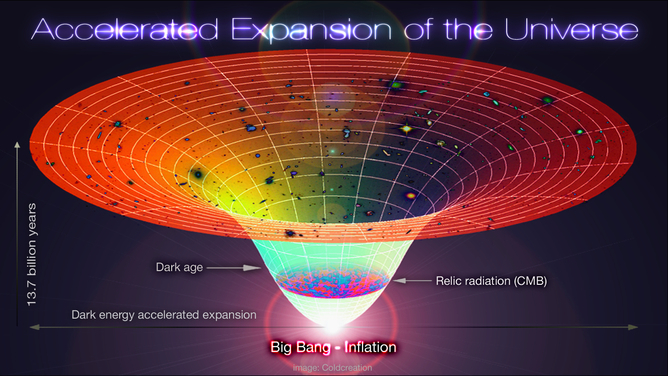 We know that our universe is expanding at an accelerating rate, but what causes this growth remains a mystery. The most likely explanation is that a strange force dubbed “dark energy” is driving it. Now a new astronomical instrument, called the Physics of the Accelerating Universe Camera (PAUCam), will look for answers by mapping the universe in an innovative way. The camera, which will record the positions of around 50,000 galaxies at once, could also shed light on what dark matter is and how the cosmos evolved. In the 1990s, astronomers studying exploding stars – supernovae – in galaxies far away discovered that the universe’s expansion was accelerating. This came as surprise, as scientists at the time thought it was slowing down. With no obvious solution at hand, scientists argued that there must be some sort of mysterious force – dark energy – pulling the universe apart. Fast forward about two decades and we still don’t know what dark energy is, thought to make up 71% of all the energy in the universe. One theory says it can be explained by an abandoned version of Einstein’s theory of gravity – known as the “cosmological constant” – which is a measure of the energy density of the vacuum of space. Another argues that it is caused by enigmatic scalar fields, which can vary in time and space. Some scientists even believe that a weird “energy fluid” that fills space could be driving the expansion. Of course, the only way to find out is through observation. 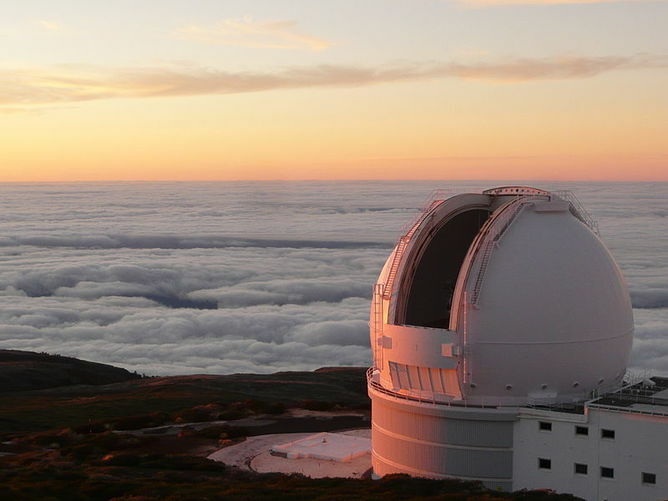 After spending six years under design and construction by a consortium of Spanish research institutions, PAUCam was successfully tested out for the first time this month – seeing “first light” on the 4.2 metre William Herschel Telescope on La Palma in the Canary Islands. Using the information captured by PAUCam, an international team, including researchers from Durham University’s Institute for Computational Cosmology, is being set up to build a unique map of how galaxies are arranged in the universe. Such a map will contain detailed new information about the basic numbers which govern the fate of the universe; its expansion and about how the galaxies themselves were made. The map will reveal the extent of structures in the distribution of galaxies. These structures grow due to gravity – if the expansion of the universe is speeding up, then it is harder for gravity to pull matter together in order build these structures. Knowing the strength of gravity and measuring the size of structures in the galaxy distribution can therefore help us deduce the expansion history of the universe. Astronomers can map the positions of galaxies on the sky by taking images or photographs. These are projected positions and so do not tell us the distance to a galaxy from the Earth. A galaxy could appear to be very faint because it is at a large distance from us or simply because it is nearby, but is intrinsically faint with few bright stars. Traditionally, astronomers have used spectroscopy to measure the distance to a galaxy. This technique works by capturing the light from the galaxy and spreading it out into a spectrum according to its wavelengths. In this way, they can investigate the pattern of lines emitted by the different elements in the stars that make up the galaxy. The further away the galaxy is, the more the expansion of the universe shifts these lines to appear at longer wavelengths and lower frequencies than they would appear in a laboratory here on Earth. The size of this so-called “redshift” therefore gives the distance to the galaxy. Early surveys of galaxy positions painstakingly measured such spectra one galaxy at a time, pointing the telescope at each galaxy in turn. Modern surveys can now record up to a few thousand galaxy spectra in a single exposure. PAUcam will revolutionise survey astronomy by measuring the distances to tens of thousands of galaxies it can see each time it looks at the sky. It does this by taking 40 photographs or images using special filters that isolate a portion of the light emitted by a galaxy. This allows a quick spectrum to be built up for each galaxy at a fraction of the traditional cost. This spectrum also acts like a DNA for each galaxy, encoding information about how many stars it contains and how quickly new stars are being added. My team here at Durham will build computer models of the evolution of the universe, which aim to describe how structures like galaxies have developed over 13.7 billion years of cosmic history. The cosmologist’s universe is mostly made up of an unknown substance called dark matter, with a small amount of “normal matter”. PAUCam will allow cosmologists to test their models for building galaxies by measuring the lumpiness of the galaxy distribution in the new map. This is important because it tells us about the distribution of the dark matter, which we cannot see directly. We know from previous observations that galaxy clusters contain dark matter. By counting the number of galaxies in a cluster, astronomers can estimate the total amount of (visible) matter in the cluster. By also measuring the velocities of the galaxies, they find that some are moving so fast that they should escape the gravitational pull of the cluster. The reason they don’t is because huge amounts of invisible dark matter is increasing the gravitational pull. If the galaxies are very clustered – or their distribution is lumpy – then the computer simulations show that this means the galaxies live inside more massive dark matter structures. PAUCam will allow us to learn more about an effect called gravitational lensing, in which the mass in the universe bends the light from distant galaxies, causing their images to appear distorted. Scientists can study the distortions to calculate how massive the patch of the universe really is – including the dark matter. This is one of the key probes of dark energy that is planned for the European Space Agency’s Euclid mission, which is scheduled for launch in 2020. The lensing distortion depends on the lumpiness of the dark matter, which is turn is determined by how fast the universe is expanding. If the universe expands at a fast rate, then it is harder for gravity to pull structures together to make bigger ones. PAUCam will help us to disentangle the signal from gravitational lensing from simple alignments between the orientations of galaxies which develop as they form. A galaxy survey like PAUCam has never been attempted on this scale before. The resulting map will be a unique resource to help us learn more about how galaxies are made and why the expansion of the universe seems to be speeding up. We hope to have the answer once the PAUCam survey is finished by around 2020. Carlton Baugh is Professor of physics at Durham University.